The Swamiji has attained the highest state of spiritual experience and the Vedas and Upanishads flow from his lips more freely than the Ganges though on a material plane. He never underwent any formal education. Goddess Saraswati it seems resides on his tongue and there is a font of perennial knowledge following from within, the source of actual experience and not any academic knowledge. . The path Swamiji follows is the path of Bhakti. A great devotee of Lord Hanuman he has become one with the Lord in every sense of the word. Externally his appearance even suggests the aspects of the Deity. 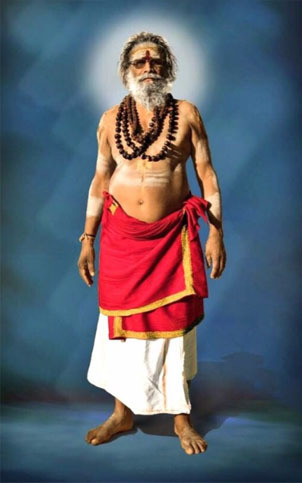 The Swamiji is a living example of the long line of great Rishis that this country owes its spiritual lineage to. It is as if in answer to Lord Krishna's promise as aspect of divinity has taken a human form for the restoration of Dharma in these troubled times. In the past 30 years, streams of ever increasing devotees have sought refuge in him to solve their temporal problems and seek peace. To all these swarms of devotees he has lovingly opened his heart and fed them both with spiritual and sathvic food. An "Akshaya Patra" awaits all those who visit this place as they are never sent home without being fed. The Swamiji's kitchen is always open to all devotees of all sects, caste and creed without distinction.